Pandit PET upgradatioon | upgradtion of existing pandit PET posts | Language Pandit Grate 2 and PET posts upgradation | posts upgradation of Laguage Pandit and PET | grade II pandit posts are upgraded to School Assistant | PET posts are upgraded to Physical Director Posts | all the existing grade II posts in High Schools are upgraded to SA Languages | all the existing posts in High Schools are upgraded to PD/Physical Director posts | representation of the unions, posts of LP grade 2 in all the high schools are upgraded to School Assistant Languages and all PET posts in all the high schools are upgraded to Physical Director. Implementation of the Right to Education Act there will be no more SGT cadre posts in high school in Telangana. all equivalent to SGT cadre i.e. LP Grade II and PET posts are hereby upgraded to School Assistants Language and Physical Director. After careful examination in the matter Govt has taken a decision to upgrade all the existing posts of LP grade II and PET posts be to upgraded to SA Languages and PD. Teachers who are working in the posts of Language Pandit Grade II and PET are going to be promoted as SA Languages and PD. Hence their pay must be fixed to the minimum time scale of School Assistant as per the PRC 2015. In PRC 2015 the School Assistant and equivalent cadre's minimum basic pay is fixed at 28,940. So the pay of all the Language Pandits and PETs who are working in the updagraded posts will be raised to the minimum scale of 28,940. If their pay is above the 28,940 then their pay will be awarded with the schools assistant pomotion incremental benefits. All the DDOs must take necessary action accordingly to raise the pay of Language Pandits and PETs. A Calculator Software is launched to calculate the hike in salary of those who are going to take promotion under the upgraded posts. Immediate you can see the table showing the increment benefit of SA cadre and enhancement of basic pay details with Gross Amount. upgradation of Pandit PET posts pay fixation calculator Pay fixation calculator for promotion in upgraded post. 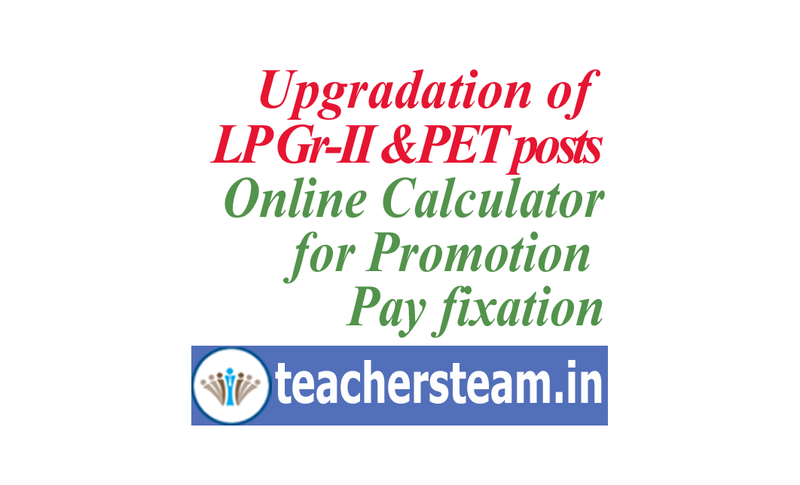 In the Promotion cadre As per FR 22(1)A an increment will be sanctioned with immediate effect from the date of Promotion and as per FR 22, 2nd increment of promotion will be awarded on next AGI month along with the regular Annual Grade Increment if incumbent fixation done with respect to the increment date. incumbent is less than 28940 and if pay fixed on the date of promotion as per FR 22(B). Hence teachers are requested to think before selecting the date of fixation carefully.